Talvin Singh, OBE Percussionist, Composer and Producer at Illuminating India: An Evening with Talvin Singh & Yorkston / Thorne / Khan, 23 March 2018 © The Board of Trustees of the Science Museum. As the ‘Illuminating India’s exhibitions: Photography 1857–2017 and 5000 Years of Science and Innovation’ at the Science Museum came to an end on Sunday, we look back on the season’s fantastic and packed out events programme, which was presented by the Museum in partnership with the Bagri Foundation. An eclectic range of events, talks and screenings exploring Indian science, technology and innovation celebrated the diverse cultural fabric of India. Beginning in October 2017, events included, a fascinating conversation with yogi and mystic Sadhguru and New York Times best-selling author and scientist Jo Marchant, exploring how the mind body connection and how science and spirituality can co-exist. The programme also offered two glorious evenings of Indian classical music and dance. Sitarist Mehboob Nadeem, accompanied by Mitel Purohit on tabla opened with stunning music followed by a mesmerising performance by the world-renowned Nrityagram Dance Ensemble. The Science Museum played host to extra special screenings of acclaimed films Slumdog Millionaire + a Q&A with director Danny Boyle, and The Man Who Knew Infinity, with an engaging panel discussion on the man whose theories revolutionised mathematics: Srinivasa Ramanujan, in partnership with the Royal Society. The Museum also dedicated a special Lates event to the science, sounds and spirit of India, offering visitors the opportunity to experience Garba Folk Dance, take part in a Silent Disco with DJ Wondergupta, create their own Rangoli and Kolam patterns, enjoy Indian folk and blues or show off their cricket skills. As part of the Lates, Moumita Dutta gave a talk on India and space and how the India Space Research Organisation managed to get a probe to Mars for less than the cost of the film Gravity. The finale of the programme took place on Friday March 23 2018 with an enthralling mutli-sensory experience. 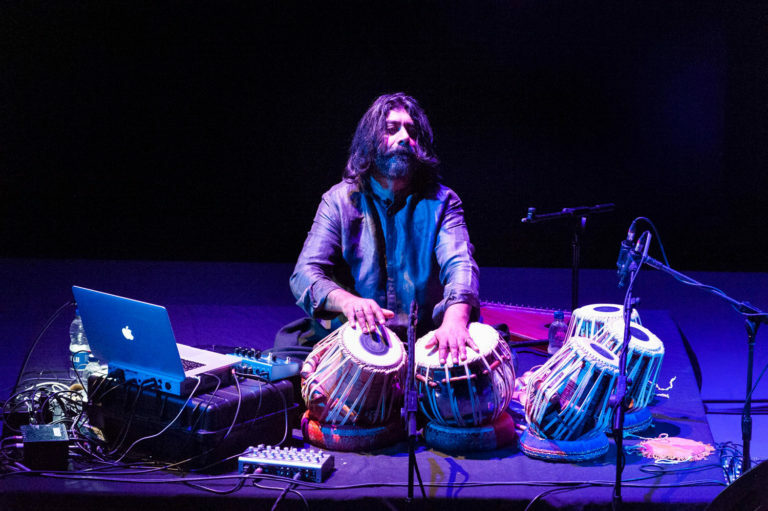 Talvin Singh OBE Percussionist, Composer and Producer headlined a glorious evening of music, with a mesmerising response to the Photography 1847-2017 exhibition, joined by Suhail Yusuf Khan on sarangi and vocals. Khan was also part of an exceptional opener with his trio – Yorkston Thorne Khan.